The Android owner's dream PC? 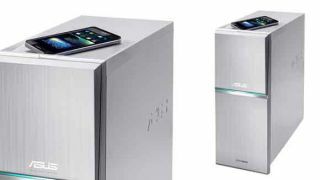 Asus just announced the M70 desktop, which it claimed is the first desktop PC to feature built-in near field communication (NFC) technology. As PC World pointed out today, that's only half true; the HP Spectre One all-in-one desktop PC also has NFC, though it lacks a tower. So the Asus M70 is the first desktop PC tower to feature the bump-based data transfer tech - but what does that mean? It means that the M70 might be the Android owner's dream PC. The NFC tech in the M70 allows the desktop tower to interact with Android phones in a number of useful ways. Using Asus' NFC Express software and compatible devices like tablets and smartphones, you can transfer photos and videos to the PC over NFC, quickly launch apps, games and web sites, log into Windows 8 without having to enter a password, and use Wi-Fi GO! Remote Desktop. The press release announcing the M70 mentioned Android devices specifically, so it's unclear whether other NFC-ready gadgets will work as well. We asked to Asus to clarify that point and we'll update this story if we hear back. The M70 also features a wireless charging tray for mobile devices on top, plus Ai Charger software, which USB-connected mobile devices charge faster. There's no pricing or release date for the M70 yet, though a range of Intel processors and Nvidia graphics cards are available for different configurations. It's also worth noting that custom PC builders can get many of the same features using the NFC Express dongle that Asus released last month. What is NFC, and why is it in your phone? TechRadar explains it all.